Hot Sox were Teemu Näppilä (vocals, keyboard and guitar), Tuomas Hämeen-Anttila (guitar), Tauno Railo (bass) and Jari Tomperi (drums). The name Hot Sox came from the band claiming that "our music is so hot that it will make your socks heat up!". They started out by playing melodic new wave rock, with live cover songs from people like Elvis Costello, after which the band's style started to evolve. Due to their inexperience, Hot Sox considered the first single 'Isn't That Right' (1980) a failure, though the B-side track 'Bats' was re-recorded for the band's album. Hot Sox claimed they wanted to distance themselves from the currently fashionable ”futurist” bands, saying ”For us music is more important than pretty clothes”. The music of Hot Sox was reminiscent of Talking Heads, David Bowie, Brian Eno, Roxy Music, Robert Fripp's new wave-era King Crimson and to some small extent, Kraftwerk. The band was taken under the wings of Upi Sorvali (1952 – 1989), an acclaimed studio musician, composer and producer who was also responsible for the production duties of their singles and album. The reception of Hot Sox was only lukewarm in the early 1980s Finland where the audiences were not exactly ready for British-style artpop (except maybe for a chart act like Paul Oxley's Unit). The single 'Plastic Twist' managed to get some radioplay, though. The longplay Die Arbeit came out in September 1981. Whatever the merits of their only album for our nostalgic ears may be, at least such contemporary critics as Pertti Ojala of Soundi panned the band's LP. What was to be their last release, the album's title track was published as a single by German label Autobahn Records in 1982, but didn't manage to make any waves, so Hot Sox disbanded soon after. 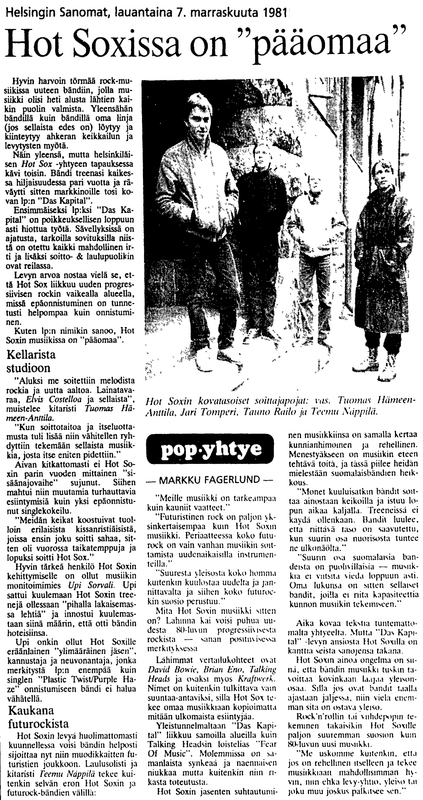 In the early 1990s Teemu Näppilä would go on as a member of Jay & The Miracles. The bass player Tauno Railo found himself, among all, in the ranks of world music-influenced prog band Piirpauke. Upi Sorvali - kalimba on A4., yangqin on B4. Produced by Upi Sorvali & Hot Sox.